Hello readers! There’s still time to enter in the Sur la Table $50 gift card giveaway! Every so often I would make bangers and mash for dinner. I usually use Bratwurst sausages. But in the month of March, my market always carries Irish bangers. In celebration of St. Patrick’s Day, I thought I’d make it as Irish as possible. Starting with the Irish bangers and then the Guinness beer. 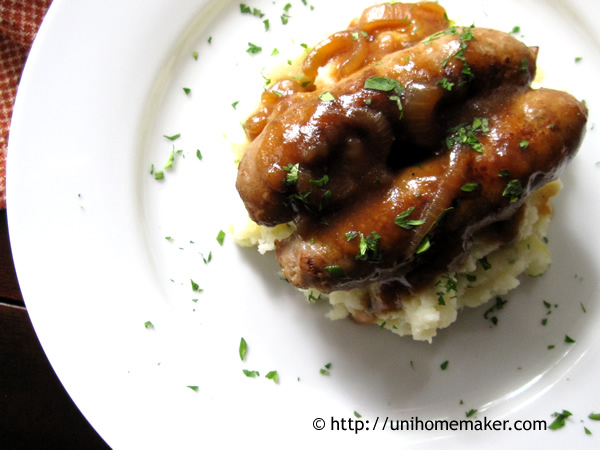 You have Bangers and Mash with Guinness Onion Gravy! I served my bangers with green onions and buttermilk mashed potatoes but feel free to use your favorite mashed potato recipe. Happy St. Patrick’s Day!